Rain is coming tonight so I planted some seeds. I also decided to pull a few weeds. Dandelions, while pretty, had taken over. I also pulled out some of the clover. I wondered if I should have just let them stay. I got a cold drink and sat down at my nook. I typed in the name and took a quick look. Hundreds of sites came up on the screen! They are beneficial was the general theme. Next time I’ll leave them and sit in the shade. I had always wondered about dandelions, and I have always thought them kind of pretty with their sunny yellow color. Now I not only think they are pretty but am excited to have them popping up in the garden. According to Wikipedia as well as a few other gardening blogs, dandelions are a beneficial weed and a good companion plant for tomatoes and various grains. The tap roots break up the soil and bring nutrients up from way down deep. This benefits annuals and other plants with shallow roots without competing with them. Another bonus? They attract honeybees and repel armyworms, which sound awful. They eat everything in one spot and then march on to another until they have devastated the entire garden. 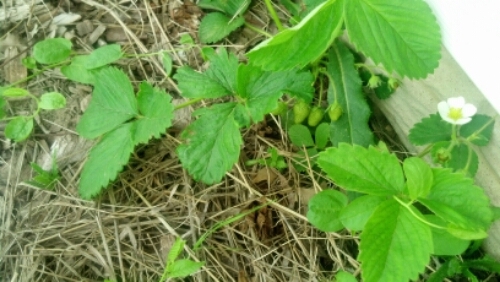 A few other discoveries…we have strawberries, small and green right now, but if the birds leave them be we will have a bumper crop this year. 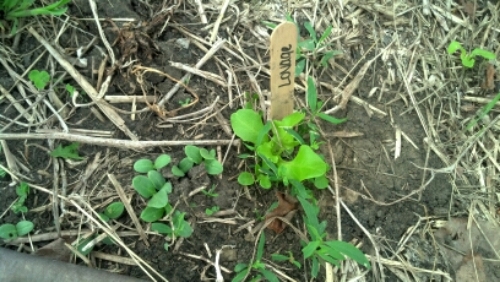 The lovage is coming up in the kitchen garden, as well as some lettuce that went to seed last year. 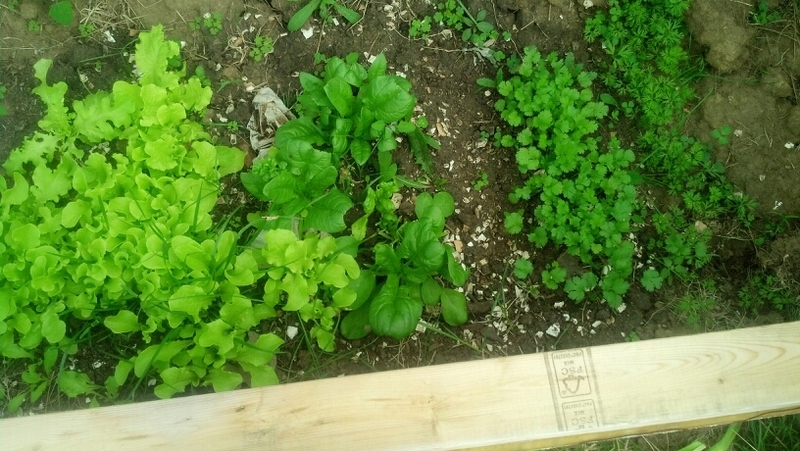 The lettuce, spinach and cilantro in our cold frame are almost ready to be harvested again. 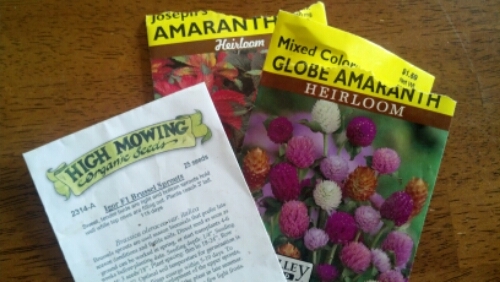 I planted amaranth and brussel sprouts in the kitchen garden. Now I’m going outside with Joe to plant some petunias…I’ll be leaving the dandelions alone though.